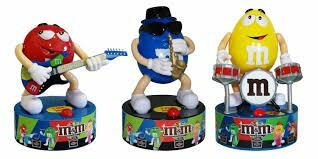 M&M'S® Rock Star Band. Press the button to watch the M&M's move and jam! Each Rock Star comes with 1 fun size pack of M&M'S®. If you have any questions about this product by M&M's, contact us by completing and submitting the form below. If you are looking for a specif part number, please include it with your message.